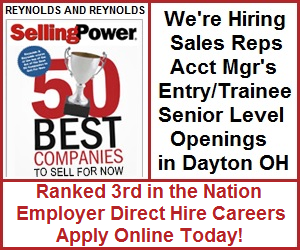 Entry-Level Sales Representative Needed in Dayton, OH. Founded in 1866, The Reynolds and Reynolds Company provides document and software solutions to the automotive industry. Our offerings cater to the very specific needs of the various dealership functions, from parts and service, to accounting and sales. With more than 4,300 associates, worldwide, we were recently ranked 3rd in the “50 Best Companies to Sell For” by Selling Power magazine. Throughout the nearly century and a half Reynolds and Reynolds has been in business, we’ve built a strong, recognizable brand of trust among our customers and our people. As an Entry-Level Sales Representative, you will conduct daily sales calls to established contacts at automotive dealerships to create awareness of our products, upcoming events and special promotions. Importantly, you will work with assigned product specialists and account managers to drive additional revenue growth. Full training, consisting of classroom lectures and on-the-job mentoring, will be provided. This position will help jump-start your career in sales and your future potential for unlimited earnings. • Advancement opportunities—we promote from within! To qualify, you should hold a Bachelor’s degree or the equivalent in experience, excellent customer service skills, and strong written/verbal communications skills. Periodic travel may be required. 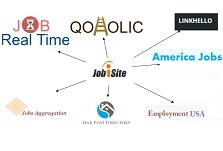 Build a challenging and rewarding career with an established and growing company! Apply easily and conveniently online at: http://www2.ourcareerplace.com/ReyReySalesRep. The Reynolds and Reynolds Company is an Equal Opportunity Employer.